The VMware vCenter driver also interacts with the OpenStack Image Service to copy VMDK images from the Image Service back end store. The dotted line in the figure represents VMDK images being copied from the OpenStack Image Service to the vSphere data store. VMDK images are cached in the data store so the copy operation is only required the first time that the VMDK image is used. Ephemeral Disks. Ephemeral disks are not supported. A future major release will address this limitation. Injection of SSH keys into compute instances hosted by vCenter is not currently supported. Currently, OS boot VMDK disks with an IDE adapter type cannot be attached to a virtual SCSI controller and likewise disks with one of the SCSI adapter types (such as, busLogic, lsiLogic) cannot be attached to the IDE controller. Therefore, as the previous examples show, it is important to set the vmware_adaptertype property correctly. The default adapter type is lsiLogic, which is SCSI, so you can omit the vmware_adaptertype property if you are certain that the image adapter type is lsiLogic. The ESX hypervisor requires a copy of the VMDK file in order to boot up a virtual machine. 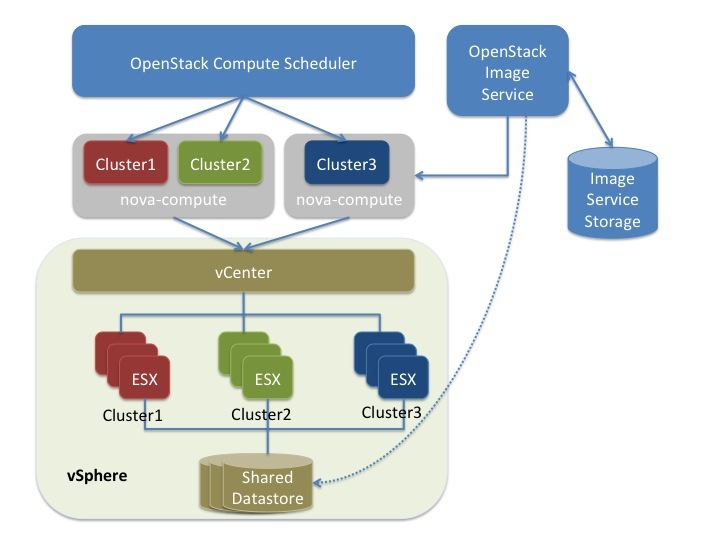 As a result, the vCenter OpenStack Compute driver must download the VMDK via HTTP from the OpenStack Image Service to a data store that is visible to the hypervisor. To optimize this process, the first time a VMDK file is used, it gets cached in the data store. Subsequent virtual machines that need the VMDK use the cached version and don't have to copy the file again from the OpenStack Image Service. Set this parameter to True to specify that unused images should be removed after the duration specified in the remove_unused_original_minimum_age_seconds parameter. The default is True. To customize the VMware driver, use the configuration option settings documented in Table 2.58, “Description of VMware configuration options”.